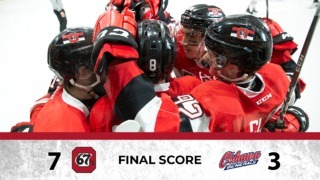 The Ottawa 67’s continued to roll through their latest road trip, downing the Flint Firebirds 7-4 for their fifth-straight win on Saturday afternoon. Graeme Clarke and Austen Keating both scored twice, while Tye Felhaber, Sasha Chmelevski and Kevin Bahl added the other goals for the Barber Poles. Jake Durham, Hunter Holmes, Ty Dellandrea and C.J. Clarke struck back for Flint, who are still looking for their first win this season. Clarke opened the scoring with two goals in the first period. The two teams headed to the locker room after 20 with a score of 2-1 after Jake Durham scored just before the end of the period. 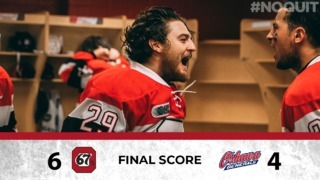 The second third saw seven goals scored, four for Ottawa and three for Flint. Felhaber scored 4:34 minutes in before Flint answered back with two quick goals. Chmelevski, Bahl and Keating all found the back of the net in about three minutes combined. C.J. Clarke made it a two goal game with a minute and a half left of the second twenty. Keating, who gave his team a three-goal cushion early in the third period, Felhaber and Chmelevski would all end the game with three points each. The win gives Ottawa all four points up for grabs on the trip so far. 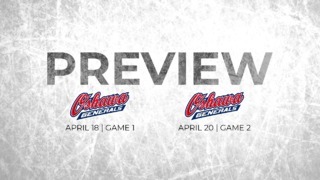 Up next is a trip to Saginaw Sunday at 5:30 PM for the final away game of the week before returning home to host the annual School Day Game at the Arena at TD Place at 11 a.m.